Most metaheuristics are either based on neighborhood search or the construction of solutions. Examples of the latter include ant colony optimization (ACO) and greedy randomized adaptive search procedures (GRASP). These techniques construct solutions probabilistically by sampling a probability distribution over the search space. Solution constructions are sequential and independent from each other. Moreover, greedy information is used in a probabilistic way as the only source of knowledge on the tackled problem (instance). Note that metaheuristics that are based on solution construction can also be interpreted as incomplete tree search algorithms. In contrast to ACO and GRASP, more classic heuristic tree search methods such as the branch-and-bound derivative known as beam search, for example, make use of two different types of problem knowledge. In addition to greedy information, they exploit bounding information in order to prune branches of the search tree and to differentiate between partial solutions on the same level of the search tree. Moreover, these methods can be seen as generating solutions in a (pseudo-)parallel, nonindependent way. 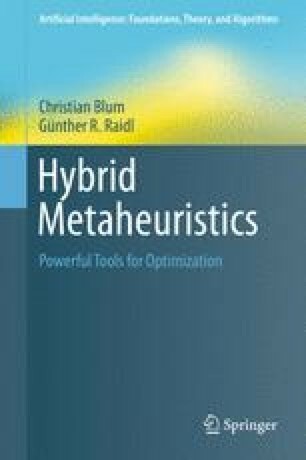 The general idea of this chapter is to improve metaheuristics based on solution construction by incorporating bounding information and the parallel and non-independent construction of solutions.